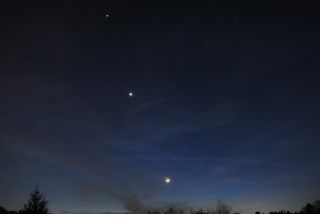 Astrophotographer John Green caught the moon, Venus and Jupiter over Mooresville, NC, Feb. 23, 2012. If the weather is clear this weekend, even those who normally do not look at the sky may be struck by a dazzling celestial scene in the west after sunset: a view of two bright planets and an even more eye-catching crescent moon. The two brightest planets, Venus and Jupiter, will accentuate the beauty of the slender crescent moon on Saturday and Sunday (Feb. 25 and 26). The planet Mercury may also be visible too, low on the horizon, beneath Venus depending on your sky conditions, but it will disappear quickly after sunset. Even if your local weather brings clouds or rain, you can still watch Venus, Jupiter and the moon align online via online broadcasts. This sky map shows how the planets Mercury, Venus, Jupiter and the crescent moon will appear on Feb. 25, 2012 at 6 p.m. local time, just after sunset, to skywatchers at mid-northern latitudes. Venus, the "Queen of the Sky," can put on a show all by itself, at times far outshining any other object in the night sky except for the moon. It's so bright that you can even glimpse it in the daytime — if you know exactly where to look. The sky maps of Jupiter and Venus for this story show how the planets and the moon will appear together on Saturday and Sunday. Astronomers call this cosmic arrangement a triple conjunction. Early Saturday afternoon, if your sky is clear and blue, try locating the crescent moon at around 1 p.m. local time. It will be roughly two-thirds up from the southeast horizon to the point directly overhead. On Sunday evening, the moon will have moved up, almost to where Jupiter is, sitting off to the lower right of the bright gas giant planet. Another planet is also gracing the night sky in addition to Venus, Jupiter and Mercury: Mars. The Red Planet is currently rising in the eastern sky a few hours after sunset. This sky map shows the position of Mars is inthe eastern sky at 8 p.m. local time on Feb. 25, 2012 to skywatchers in mid-northern latitudes. This weekend's dazzling skywatching show is a good occasion to reflect on the astronomical history associated with Earth's moon. It has been said that the calendar is humanity's first scientific invention and the moon has played an important role in this regard. Calendars, such as the ones used in the Jewish and Muslim faiths, have lunar months that begin on the evening when the crescent moon first appears in the western sky at sundown. Astronomers define the "new moon" as that moment when the moon occupies the same ecliptic longitude as the sun. Since the moon is then in close proximity to the sun in the sky, it cannot be seen (unless in silhouette during a solar eclipse). In popular parlance, the term "new moon" refers to when the moon appears as a narrow sliver over the next few evenings, adding delicate beauty to the western twilight as a thin arc of light enclosing a ghostly ball. Here was the signal by which the ancients set their calendars. But how is it that we can see the entire outline of the moon when it's in its crescent phase? To answer this question, let’s imagine ourselves as astronauts on the surface of the moon. The Earth as seen from the moon would loom in the sky nearly 3.7 times larger than the moon does for us. In addition, the land masses, the oceans and clouds make the Earth a much better reflector of sunlight as compared to the moon. In fact, the Earth's reflectivity varies as clouds, which appear far more brilliant than the land and seas, cover greater or lesser parts of the visible hemisphere. The result is that the Earth shines anywhere between 45 times to as much as 100 times more brightly than the moon. So it is not only a larger mirror to reflect the sunshine, but owing to our atmosphere it’s a far better reflector as well. And the Earth also goes through phases, just as the moon does for us, although they are opposite from what we see from Earth. The term for this is called "complementary phases." On Tuesday (Feb. 21), for example, there was a new moon for us, but as seen from the moon that day, there appeared a brilliant full Earth in the lunar sky. Now, as the sliver of a crescent moon slowly grows each night in our western twilight sky, its entire globe may be glimpsed. This appearance is popularly called "the old moon in the new moon's arms," for the bright crescent seems to be wrapped around the faintly lighted part. Sunlight is responsible for the slender crescent, yet the remainder of the moon appears to shine with a dim bluish-gray tone, because a considerable part of it is sunlight reflected by our atmosphere; the air around us scatters the bluer colors most effectively, as our blue daytime sky clearly shows. So while the dark portion of the moon is not receiving sunlight, it shines dimly by virtue of earthlight: the nearly full Earth illuminating the otherwise dark lunar landscape. Use binoculars or a small telescope to better appreciate the appearance of the full globe of the moon, its grayish-blue tone delicately interposed between the brighter sunlit crescent and the not-much-darker background sky. Unlike a full moon, which can sometimes appear almost blindingly bright and flat, like a one dimensional disk, an Earth-lit crescent can appear strikingly three-dimensional. Da Vinci figured it out! Leonardo Da Vinci was the first to recognize the dim ghostly glow of earthshine. In his Codex Leicester, written between 1506 and 1510, there is a page entitled "Of the Moon: No Solid Body is Lighter than Air." Leonardo suggested that the moon has an atmosphere and oceans like Earth. As such, Da Vinci thought, the moon was a good reflector of light because it was covered with so much water. As for the "ghostly glow," he explained that it was due to sunlight bouncing off Earth's oceans and, in turn, hitting the moon. Da Vinci, of course, had it all wrong about the moon: We now know it does not have an atmosphere nor any flowing liquid oceans. And while he correctly assumed that sunlight is reflected from the Earth to the moon, it is the clouds that are chiefly responsible for the reflected light, not the oceans. Is it a grin or a cup? Lastly, take note that the cusps or "horns" of the crescent moon always point directly away from the sun's place; after new phase they're pointing in the direction that the moon is going. During late winter and early spring the crescent moon resembles a thin smile on the sky, perhaps reminding some of the distinctive mischievous grin of the Cheshire Cat in Alice in Wonderland. Others may see the crescent resemble a cup that might hold water — call this a wet moon if you want to follow old-time tradition. If you snap an amazing photo of Jupiter, Venus the moon or any other skywatching target and would like to share it for a possible story or image gallery, please contact SPACE.com managing editor Tariq Malik at tmalik@space.com.